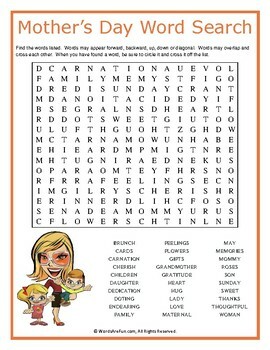 A word search puzzle featuring words associated with Mother's Day. 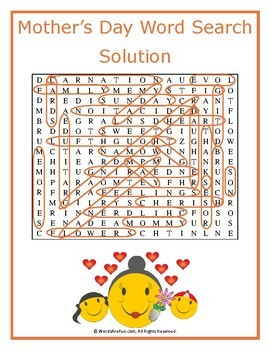 This puzzle is great for your celebration or anytime during the year when learning about this holiday. Use this sheet as part of your teaching curriculum, a treat for early finishers or just for fun. Word List: Brunch, Cards, Carnation, Cherish, Children, Daughter, Dedication, Doting, Endearing, Family, Feelings, Flowers, Gifts, Grandmother, Gratitude, Heart, Hug, Lady, Love, Maternal, May, Memories, Mommy, Roses, Son, Sunday, Sweet, Thanks, Thoughtful, Woman.